My dad is a major hoarder! Everyday he would come home with bags and bags of goodies or junk. Most of the time it's just whatever cheap he can find from Big Lots or K-mart. One day he drag home five frozen ducks from Aldi, yes I'm talking about the discount supermarket chain. Apparently they were only $6 for a whole duck! That weekend I came home for a visit and sure enough my mom put out the duck to thaw. 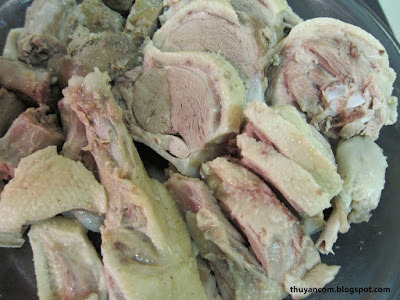 She boil the duck in water to make a broth for Bun Mang Vit while I used the meat to make Goi Vit. Yes we were all skeptical but it turn out fantastic. The meat was tender and juicy, so much better and cheaper than what we would find at Meijer or even the Asian store. My dad was very happy that we all enjoyed the duck, in fact early the next morning he went back to Aldi to buy whatever was left. Since my mom had enough duck to last the whole winter I couldn't help snatching a few to take back with me. 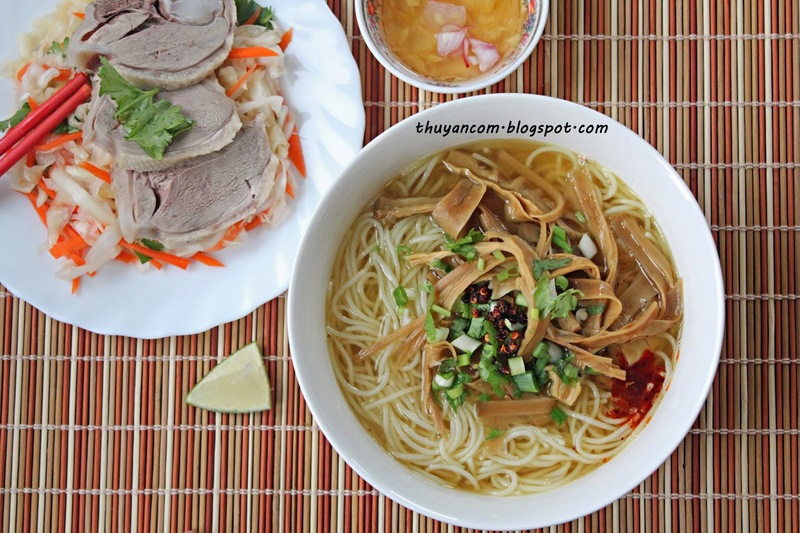 Bun Mang Vit is one of my mom's favorite soup, my mom is a soup person so she has a lot of favorites. I consider it to be an easier soup to make because there is less ingredients to work with and less preparation. The hardest part about making this soup is probably working with the duck. Whole duck have a lot of fat, it's best that you trim most of it out or the soup will be very heavy to eat. I don't have much experience butchering a duck either as you will see in my pictures. The broth is made by simmering a whole duck with smashed ginger root and sliced bamboo. Since duck alone will not give enough natural sweetness to the broth, you can use additional pork bones or a can of chicken broth. I prefer using dried bamboo from Vietnam over fresh bamboo from the States. I compare dried bamboo to pasta because you can achieve a chewy "al dente" texture. The smell of fresh bamboo can be really strong and I don't want it to overwhelm the broth. 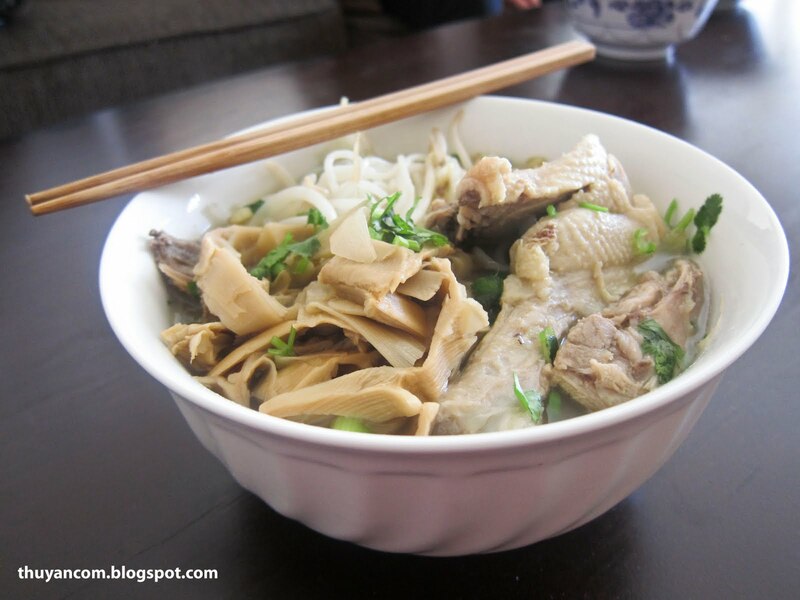 The broth to this soup is very simple, similar to a chicken broth with hints of ginger and bamboo. I always make a bowl of gingered fish sauce for Bun Mang Vit, it's great to dip the meat in and a teaspoon in every bowl enhances the soup. 1. Rinse the dry bamboo with cold water. Transfer to a pot and cover the bamboo with water. You will need to boil the bamboo until tender. Dry bamboo will give out a yellow/orange color. If you want to achieve a clear broth, you'll want to change the water a couple time until the water doesn't turn too much color anymore. 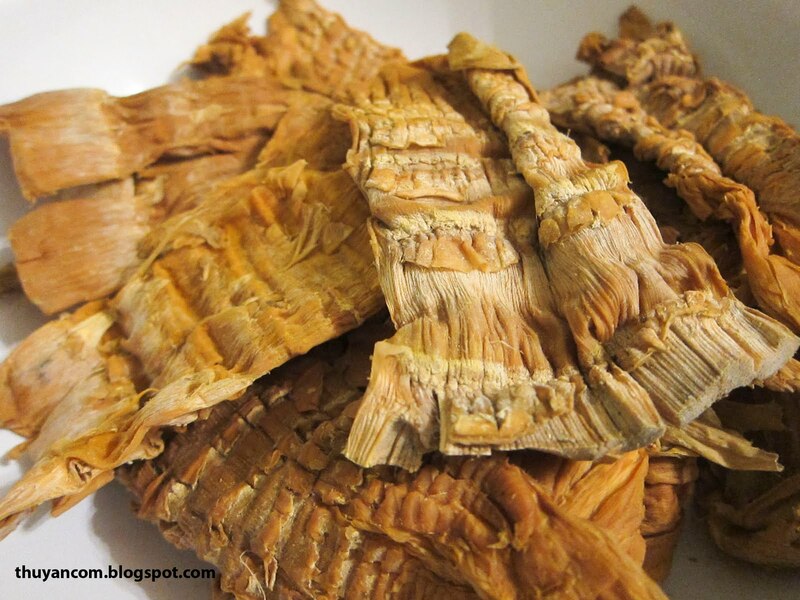 When the bamboo has soften, you'll want to discard any parts that are too chewy and then cut them into small strips. 2. Par boil the pork bones and then rinse with plenty of water. Set aside for later use. 3. 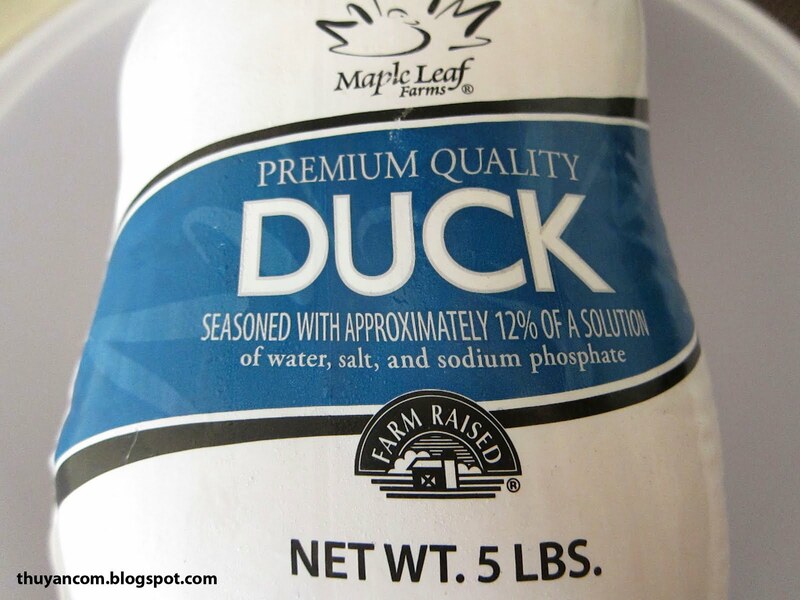 Wash the duck with some salt and cut out as much fat as you can. 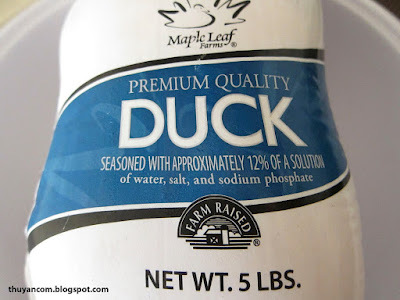 Place duck in a 6 qt. pot (or a bigger pot if you are planning to use a whole duck) and then fill with water. 4. Add some salt and let it come to a boil. Remove as much scum as you can. 5. Roast the ginger and onion in the oven. Peel the skin after roasting. Smash the ginger in a mortar and pestle, this will bring out a lot of the juice. Add the smashed ginger and onion to the pot and let the duck cook fully. 6. Once the duck is fully cook, remove and let it cool down. 7. Add the pork bones to the duck broth and fill the pot with more water. Let pork bones simmer. 7. Add rock sugar , salt, and mushroom seasoning to the broth. Continue to taste and add more salt if necessary. 8. Cut the duck into smaller section. You can throw meat back into the broth but I like to have them separate so I can eat it with the ginger fish sauce or eat it as a salad. I usually throw the bonier piece back into the pot. 9. Add the bamboo to the broth. Taste with fish sauce if necessary. 10. Mince the green onions and cilantro. 11. Wash the bean sprouts. 12. Prepare gingered fish sauce. 1. 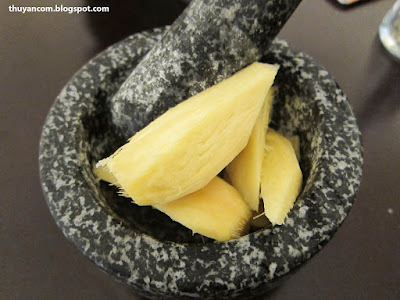 I like to smash the ginger and chili together with a mortar and pestle. 2. Add the sugar, fish, sauce, and lime juice and mix.